Want to challenge yourself, your class, your family? Try stacking games; from blocks, to cards, to marshmallows, to cups, simple household items used for stacking are good for the brain. It requires focus, fine motor control, and critical thinking to balance. We've been playing around with plastic eggs a lot this season, like many kids are right now. 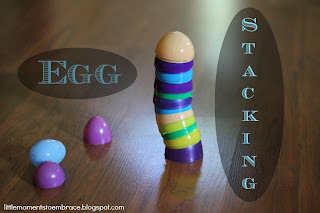 One afternoon I challenged my five year old to stack all the eggs he had on the table. It took him about ten minutes but he got it after many tries. I even got my one year old involved. I made a stack of eggs for him, and he enjoyed knocking the stack down. Sometimes he pulled one or two off the top, then tried putting one on top again. He began making the connection after watching me so many times. I could see their persistence and concentration grow as they played with the eggs. As I played along side them we tried different sized eggs, and a few different surfaces. Simple experimentation within a simple game. 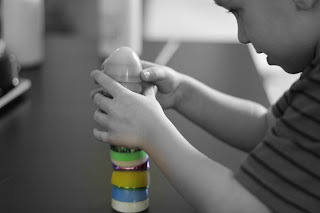 Stacking idea: Have a height stacking contest using a combination of a few materials; bottle caps, small blocks, plastic bowls, etc. 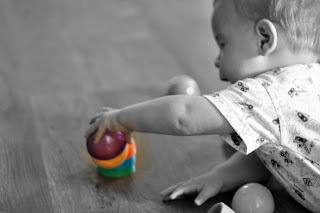 Oh, yes, the simple activities can be such fun and provide unique opportunities to make connects and practice skills. There's more to this fine motor skill than one might think! Thanks for sharing! Stacking games are indeed so fun to do. I am thinking of using a real eggshell and will just paint them in different colors!I can't wait to do it.